Psychologist Robert J. Pellegrini reported in Psychology , 1973, Volume 10, No. 1, the results of an experiment on the perception of male personality as a function of varying states of beardedness. 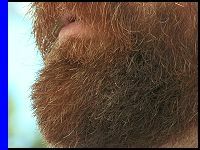 To carry out the experiment, Pellegrini hired eight full-bearded young men who were willing to have their beards fully shaved off for a payment of ten dollars. All of the full-bearded men were caucasians. Their ages ranged from 22 to 25 years. Other than the changing state of beardedness, all other variables were kept constant from photograph to photograph. Upon completion of the photographic sessions, there were a total of thirty-two photographs: four photos of each of the eight participants. The photos were randomly distributed to subjects who were asked to rate their first impressions on a number of personality traits. The subjects evaluating the photos consisted of sixty-four male and sixty-four female introductory psychology students. Each photo was judged by two males and two females. The tabulation of the results showed a generally positive correlation between the amount of hair on the object person’s face and his being perceived as masculine, mature, good-looking, dominant, self-confident, courageous, liberal, non-conforming, and older. The results also suggested a similar correlation regarding perceptions of intelligence, strength, health, and likableness. In view of the results, Pellegrini suggested that the presence of hair on a young man’s face is associated with an idealized image of the male personality. Pellegrini cautioned that the results of this study may not necessarily be generalized beyond the population that participated in the experiment. The bearded men were all young men. The results could be different for older bearded men. Similarly, the subjects judging the young bearded men were themselves college freshmen. Older subjects may have different impressions of beardedness.